Want to learn more about Platforms? Social media has become an essential means of communicating with one another, so much so that when a hurricane, tornado, storm or (in this case) an earthquake strikes, the social channels are abuzz with chatter. Let’s take a look at some of the conversations by channel and at the power of social media. 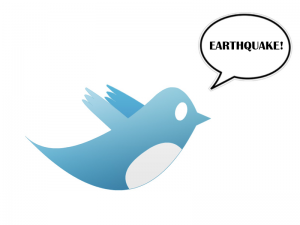 Twitter was one of the main ways in which people discussed and spread information about the earthquake. Quicker than any news source or article could be written, Twitter helped share this info in an instant. At 3 pm there were about 20 tweets referencing the earthquake every 20 seconds or so, highlighting that more than 5,000 tweets went out since the earthquake occurred over an hour earlier. The power of these platforms is undeniable when it comes to their power to communicate an event or message to the masses. Much of the content shared reflected the minimal effect the earthquake had, except for interrupting many offices’ work day. 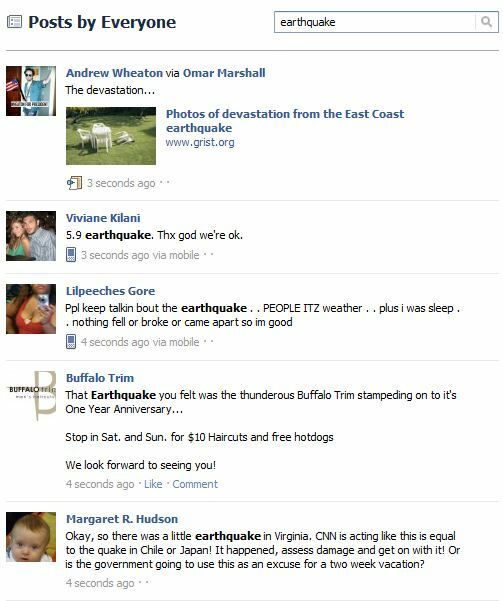 The combined power of Facebook and mobile was clearly seen today as people updated their immediate reactions during and after the subtle quake. If you take a look at Facebook’s search results for all their users, the ones with their privacy settings off of course, by searching the word ‘earthquake‘ you’ll see a constant wave of updates. Happiness, sadness, confusion and even witty remarks can be seen over the uncommon event for many people. There are even posts of pictures of fallen lawn chairs labeled ‘the devastation of the east coast earthquake.’ View the search results for yourself here (must be logged into Facebook). What happened on Foursquare was simply too funny to leave out. Brought to my attention by my co-worker Dorcas, there was a Foursquare venue created soon after the earthquake entitled “Earthquakepocalypse 2011.” This user-generated venue located in New York City got 18,974 check-ins by a total of 18,446 people and it is still rising. There are hundreds of tips appearing on this venue as well, highlighting how people use social media to make light of a situation at the drop of a hat because there were no catastrophic injuries or damage. It’s interesting to see how many people look to their mobile social platforms to share what they are doing at any downtime, even when standing outside of your office waiting for a small earthquake to pass.